In a small bowl, mix together the Chiquitita EVOO, lime juice and cumin until well-blended. 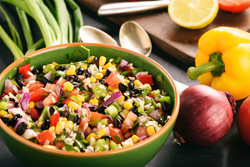 Place the rice, beans, carrots, corn, tomato, parsely, cilantro, and red onion in a large bowl and then pour the dressing on top. Gently mix all ingredients until the veggies are well-coated with the dressing. Season with salt and pepper to taste. Serve in individual serving bowls and enjoy.